Get a good understanding of how queries actually work in Resin, an embedded zero-config NoSQL database and search engine with concurrent read/write. Be sure to check out Part 1, Part 2, and Part 3 first! It does the exact same thing, but with a lot less work all around. For our purposes, we are running just a single query, so no need to worry about subqueries at this time. Looking at the Scan method, the first thing it does is to open the trie file. It looks like I missed a bunch of stuff there. The field name hash is the one used in the key, not the name itself. That means that you aren’t limited to just stuff that is safe to use on the file system. There is also a .six file that I’ve not seen before — it is related to tries — and I’m skipping it for now because I want to have a separate post about them. The problem I have is that this means that the GetTreeReader will open a bunch of files, then immediately close them. That is going to be a lot of system calls that are being generated, which can probably be saved with some effort. This is where the magic happens. This is the core for actually searching over the tries and figuring out what values we actually have there. Reminder: The Postings is actually the list of all the documents that contain this value in this field and the number of times that this value appears in the document. The problem I have here is that this method looks like it has been refactored halfway. 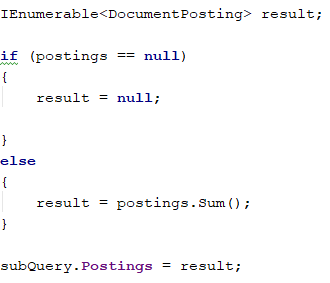 It can only return a single list, and again, there is the overuse of Linq operations and their allocations. As an aside on code formatting, in many places in the code so far, I have chosen to minify the code without changing its meaning because there is such a high overhead to the differences. I’m doing this fairly automatically because it helps me read and understand. Here is a before and after example, which was drastic enough to make me realize I’m doing this. Functionally, those two are doing the same, and I find the after option much more readable. The Sum method here is pretty horrible in the sense that it has high complexity. Luckily, it is never called with more than one list, so that cost is hidden. A fun exercise would be to compute the actual complexity with real inputs. I just looked at it and went, “this gotta be expensive,” then figured out that the code only ever calls it with a single list, so I skipped it. After getting the posting, we need to score the query. This is where we see the usage of the document hash. They are used to go from the document ID to check if the document has been deleted. The actual scoring is Tf-Idf — so pretty standard and not interesting here. Sorting can be very expensive, and I’m pretty sure that it is not actually needed here, and it would improve performance quite impressively to remove it. The unbounded result set is annoying, but I gave up that fight, I’m afraid. Let's see what Reduce does. In complex queries, I expect that it would merge all the subqueries and do filtering/intersection/etc. And it does just that, which is great. I do wonder if scoring the results could be pushed after the query reducing; that would reduce the amount of work that needs to be done. But that is a small optimization, probably. OK. That is enough for this post. I now have a pretty good understanding of how queries actually work. Next, I’m going to look at some other pieces of the code that I haven’t looked at, and then I'll focus on the trie. What Is Elasticsearch and How Can It Be Useful?